Commercial Snow Removal…A Necessity in Northeast Ohio Again! You can wear the same pants for five days in a row and no one will say anything about it. Shoveling shows up as exercise, not “work,” on the Apple Watch. Seems like work to me. It's important to maintain a network so when you need to get a skid steer or a load of salt, people are willing to help. Winter is when you find out what kind of team you have. Who's willing to go back out? Who's willing to work on Sunday? Who’s still smiling after being at work for 36 hours? Short naps become a necessary part of life, not just a guilty pleasure while the Browns play on Sundays. Buying the best commercial snow removal equipment up front hurts the wallet a bit. Being able to plow three rounds without major problems pays for itself. That being said…the colder it becomes, the more things break. The more things break, mechanics become incredibly important. I love my mechanic. People will work as long as they know the purpose, get a thank you, and feel like part of the team. Having pizza and muffins on hand helps as well. Customers understand a delay in service. Many of their businesses are affected by weather, too. The key is to communicate to them what is going on and what is being done about it. Never forget your toothbrush. Snow is not an effective mouthwash. Especially after all the coffee. Sleep deprivation clouds judgment. See comment about naps above. Note to self: remember to sleep. Snow can be disruptive to life. We have no control over it. We do have control over how we respond to it. Emotions are a choice, and positive emotions beat negative emotions every time! Finally, no one knows how to drive in the snow except me. Stay off the roads people! I’ve added a little humor to our commercial snow removal services above, but don’t be fooled…our team understands every snow storm is unique. We constantly monitor an incoming storm to ensure our customers will be serviced timely and continuously throughout the storm. 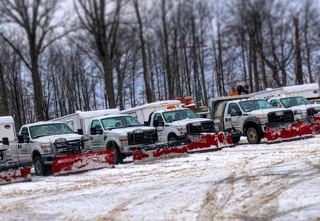 Whether an ice storm or a heavy, wet lake effect snow dumper or a Nor’easter – they all take meticulous planning to tackle properly and safely. If you would like an estimate for your commercial grounds maintenance, contact us.